We normally assume that an architect, an artist, a businessman wishes to create something that will outlive them. Something which will exist long after they are gone, as a symbol of their creativity, their greatness, their influence. Yet Stephan Brückner, the creator of the spectacular Wolwedans Lodge collection in Namibia, has quite the opposite intention. It’s an impressive mission, and one which is all the harder to fulfil in the otherworldly surroundings of the Namib, the world’s oldest desert. Far from the nearest town, impossibly distant from any building materials, with no electricity lines or water pipes, and virtually no rainfall, building any accommodation which could be attractive to visitors, let alone one which would leave barely a trace, seems like an enormous, expensive challenge. But what I found when I arrived on site was truly impressive. 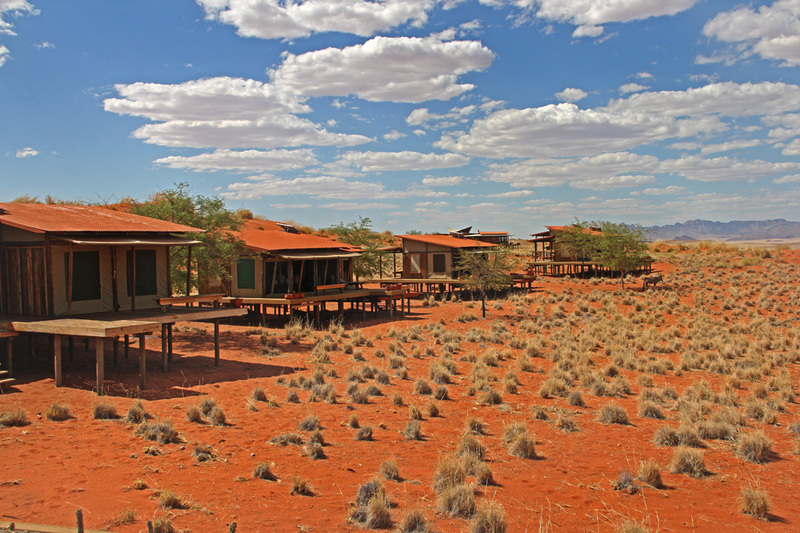 There are four camp sites in the Namib, including the Private Camp – which consists of just two rooms. I stayed at the Dune Camp – the largest of the collection, but still with just nine “chalets”. Dune Camp is wonderful in part because of its consideration for the environment, not despite it. Open-fronted to give full views of the desert horizons and scattered oryx, the structures contain natural materials, and guests are thoroughly absorbed into the desert landscapes. Tucked up in my four poster bed, surrounded by the haze of the mosquito net, I didn’t miss the constant glow of artificial lights, the low hum of electrical appliances. There was nothing to distract me from the marvellous desert expanse, the sounds of Africa at night, and the stars that light up one of the darkest skies in the world. 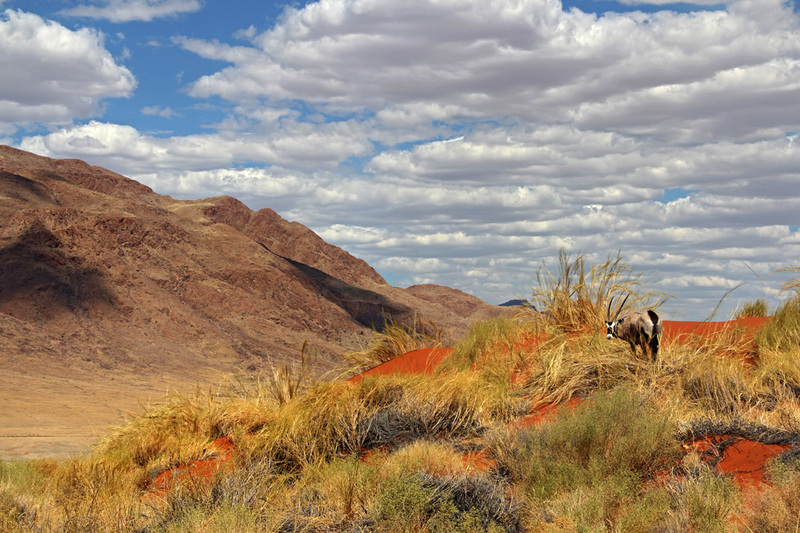 Wolwedans camps are located in the middle of the Namib Desert, and visitors can enjoy the incredible scenery as well as plenty of visiting oryx. But this level of simplicity is the result of a long and complex process. Everything which is normally taken for granted must be created at Wolwedans with great effort. Water is scarce, electricity is limited, staff must be trained and housed, food must be transported vast distances or grown on site. Stephan’s creative approach to these problems includes managing everything – food storage and preparation, staff training, vehicle maintenance – from the main lodge, to reduce the need for an extra generators or staff at the camps. 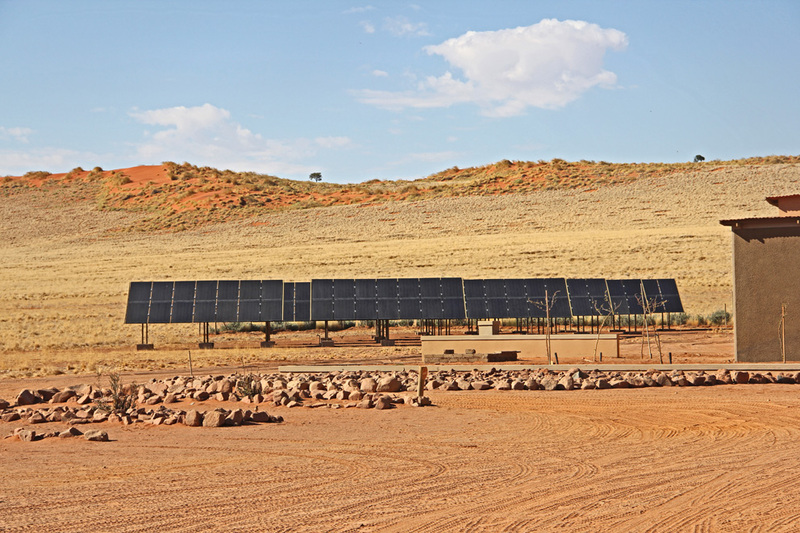 The camps themselves are powered by the desert – each chalet currently has three solar panels. But even this is not quite good enough for Stephan; having realised that empty rooms result in generated power being wasted, he intends to move the panels to a central system so that the energy can be harnessed more effectively. Creating a place for tourists when you can not rely on outside resources means that many services have to be provided in-house. Stephan led us to the workshop where safari vehicles are serviced. Currently this small facility can only cater for Wolwedans’ own vehicles, but an expansion means that it will be able to receive vehicles from other operators and lodges in the area. This is significant, as currently vehicles must travel hundreds of miles to the nearest town for repairs and servicing. Having a local mechanic in this remote region reduces fuel consumption and wasted driving time. It also allows Stefan to provide the most environmentally-friendly service possible. Food is another resource which is produced on-site. This is a lesson in how the “greener” option can often be not only cheaper but much more enjoyable. In the case of fruit, vegetables and herbs, as many as possible are now grown out here in the desert. 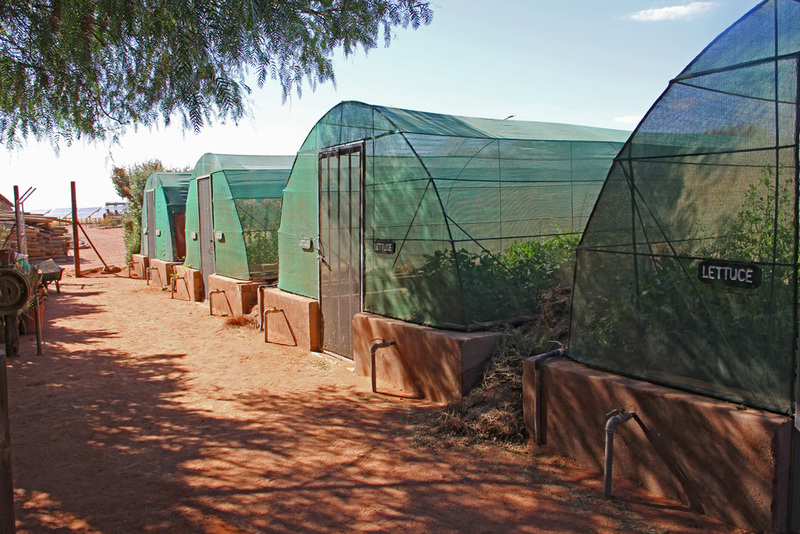 Netting shades the crops to reduce water loss and keep pests out, meaning the plants can be grown organically. This works out less costly then shipping them in from far-flung farms, especially as much produce in Namibia has already travelled from the much more verdant South Africa. Additionally, many items – such as fresh herbs and salads – would simply not survive the long journey, arriving limp and tasteless. The in-house allotments provide employment for local people; tasty, fresh produce; and save Stefan a lot of money at the same time. 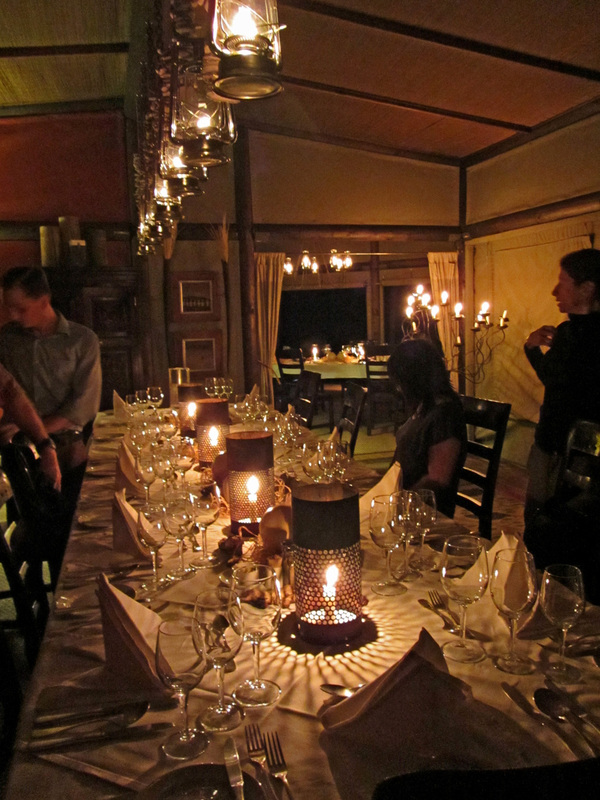 Food also offers an opportunity for cultural interaction: the night’s menu at the main lodge is read out first in English, and then in Damara – one of Namibia’s click languages -much to the enjoyment of the guests. Having your own mini farm also provides a convenient way to dispose of organic waste – it’s all turned to compost. Some in the traditional way, while the harder-to-decompose stuff is fed to the noisy, happy-looking pigs. To complete the cycle, Stefan hopes that soon the lodge will be able to harvest its own seeds, to make the entire process sustainable right here, in one of the world’s most inhospitable deserts. But it’s not true that Wolwedans will leave no trace at all. Some of Stephan’s efforts, he hopes, will have a long-term impact on Namibia. The Wolwedans Foundation has trained 170 Namibians in hospitality, giving them the chance to secure well-paid, long-term work in the growing tourism industry. The Foundation also supports and initiates cultural, community and conservation projects, ensuring that the Namib’s precious landscapes, wildlife and people are protected well into the future, maybe a long time after this beautiful lodge has ceased to leave a trace on these shifting sands. 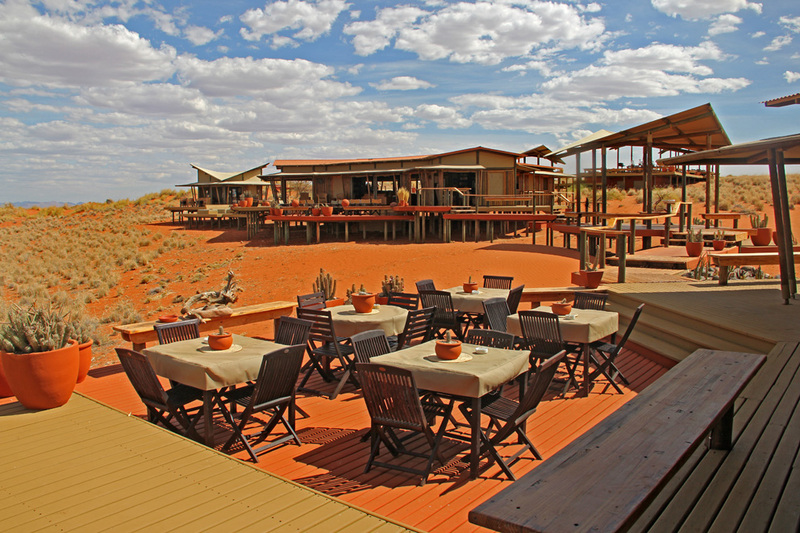 Wolwedans has four camps in the Namib Desert: Dunes Lodge, Dune Camp, Boulders Camp and the Private Camp. The big attraction here is the Namib Desert – you can arrange a photography tour, balloon flight, desert walk, private dinners, or just relax at the camps. 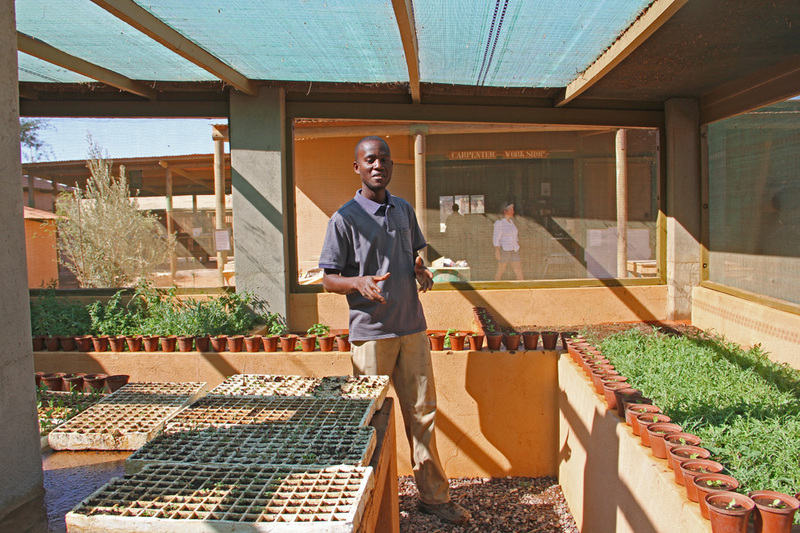 Tags: africa, desert, ecolodge, environment, namibia, sustainability, Wolwedans. Bookmark the permalink.